I know all women have been there: you're wearing a great pair of heels on and you look fab, but by the end of the night, your feet are killing you and you can't take it anymore. A few weeks ago, I was talking to a lovely woman and it turned out that she ran an amazing company, who had a solution to this problem: Coco Rose. This company was started by Janan Leo and she came up with a great concept: Foldable Ballet Flats. You buy these adorable foldable flats that you can wear while commuting, then when you get to where you need to be, you just fold them in half and swap them for your heels. 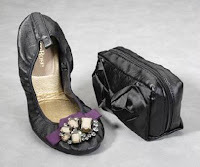 The fold away shoes also come with a matching bag that you can put them in, which fits perfectly into your handbag. Each one also comes with a shoulder bag to put your heels in when you're holding them. They are just perfect for when those killer heels are literally killing you from the pain. All you need to do is pack a pair in your bag and you're good to go. Take them on a long commute, to a wedding, party or even at the airport, when you're travelling. Not to mention, these shoes are absolutely gorgeous. 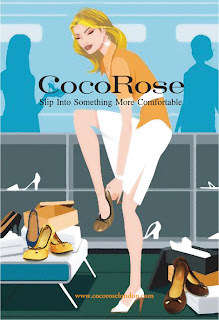 You wouldn't expect comfortable shoes to look that great, but Coco Rose makes gorgeous shoes. This is called 'Vesper', and they are stunning! It has gorgeous 'Smokey' coloured gemstones and a ribbon at the front and comes with a purse, and a satin black carrier bag for your heels. I love the look of this one, called 'Ruby'. You have lovely red gemstones at the front and its matching purse comes with a red satin bow. These 'Portia' ones are by far my favourite. The colour is amazing and they are so chic and come with a real gold leather inner sole. 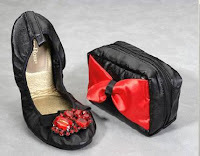 And the purse to put them in also comes with a small chain that can turn the purse into a handbag, as well as connecting the purse and the bag for your heels together. As if this brand couldn't get any better: they've also made a foldable pair of flats for Cancer Research. Naturally, they're bright pink!! Coco Rose teamed up with Cancer Research to make these amazing pair of flats for anyone wanting to look good, but also do their bit for the greater good. They are a bright pink, with butterfly bow at the front and come with a matching pink bag. And for every sale of these Fuchsia shoes, £2 goes direct to Cancer Research. I need to get these! I've lost count of all the times when my heels were killing me, but there was no way I could bring flats to change into since they were too big and bulky to keep in my bag! Such a clever idea!!! And they're gorgeous, too. I want those foldable flats. I normally bring a pair of flipflops in case my feet cries from too much pain. Flipflops are ok if you'll just head for home after an event, but sometimes, there's another one in line and I just have to suffer the torture of my heels. I looooove these, what an amazing idea! 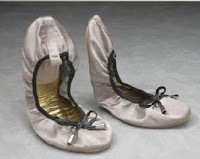 :) I am definitely going to remember this site, I love ballet flats and the fact that these are portable makes it divine. Hopefully shipping won't be too bad for me since I am in the US! The gorgeous Vespers are my favourite, but the pinks ones are very nice too. Ruby is my favourite- I love the bright red because it is unique and would add a cool pop of colour. I love the last two. I love how they look like genuine ballet flats. that is genius and i love them so much! i want them now!! A REAL MUST-HAVE FOR WOMEN, THEY WILL BE A SUCCESS! Such a good idea! They would be so convenient to have. Plus, they're all cute! I think this is such a great idea! I'm glad you posted it! I love how they have one that benefits cancer research! That is such a great cause! Those flats are so adorable! They don't take too much space too inside your bag. Love the design. I rarely wear heels when I travel I always wear flats and so this is a very good idea. My heart belongs to the pink pretties! I always carry extra shoes in my purse! :) these would be handy! These are gorgeous! I got a pair a few weeks ago and they are so comfy, brilliant quality and are an absolute lifesaver!